In the desert, ants live in colonies underground and bring useful things they find down into their home. We designed and built 20 Hermès leather ants to live in our subterranean ant apartments. Ants work together to carry Hermès tableware and cutlery down into different chambers of their home. The ant colony itself is made from CNC cut and painted foam and mdf panels. A gigantic leather cow skull sits on the desert floor, while a hidden leather chameleon in a cactus looks on. 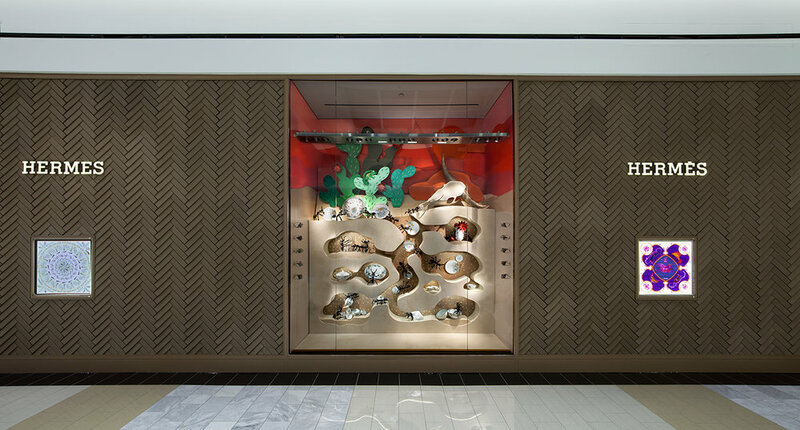 To celebrate the new Hermès boutique at King of Prussia, Heavy Eyes imagined whimsical "new homes" for Hermès products. Each of the 61 unique leather animals was prototyped, designed, and fabricated by hand in Heavy Eyes' studio. The design of each creature began as a rough paper "sketch" which was refined over and over to create a leather pattern. This type of design and construction process echoes that of the craftspeople in Hermès leather goods and shoe métiers, who create beautiful three-dimensional products from simple flat pieces. The leather used in the window displays was provided by the Hermès Sustainability Department, in cooperation with Petit H, a special Hermès workshop that creates a dialogue between artists and craftspeople to reimagine new products utilizing unused materials.